Think of Halloween as a great occasion to play dress-up extraordinaire, and try to take a moderate stand on the candy. Candy is mostly sugar and fat so we have to realize that it contributes calories with few nutrients, but it is a big part of this holiday and it is fine in moderation. Preference for sweet foods is not a human failing — it’s simply human nature. In general, candy should not be forbidden and restricted. Children must learn about moderation and frequency so that we don’t teach patterns of hoarding or becoming obsessed. As parents we must make sure that children know when sweets are appropriate in their diet, and that should be adhered to throughout the holiday season. Wait and buy candy later rather than sooner. With Halloween candy on the grocery store shelves two months prior to the event, it’s difficult to resist the fun-sized treats, but we can’t eat what we don’t bring home. Feed kids a healthy meal before they go out to a party or trick-or-treating so they won’t replace dinner with candy. Host a pre- trick-or-treat Halloween dinner with spooky background music. Hand out a printed menu with gory descriptions of kids’ favorite foods. For example, spaghetti and marinara sauce with shredded cheese becomes “brains with blood and pus.” Nutrient-rich cranberry juice mixed with apple cider and orange juice becomes “murky blood.” Kids really love the idea of eating gross food on Halloween, and parents are satisfied knowing that their kids are actually just eating a healthy dinner. If you’re hosting a Halloween party, make it a seasonal festival. Serve pumpkin muffins and spiced apple cider, and have the kids dunk for apples. 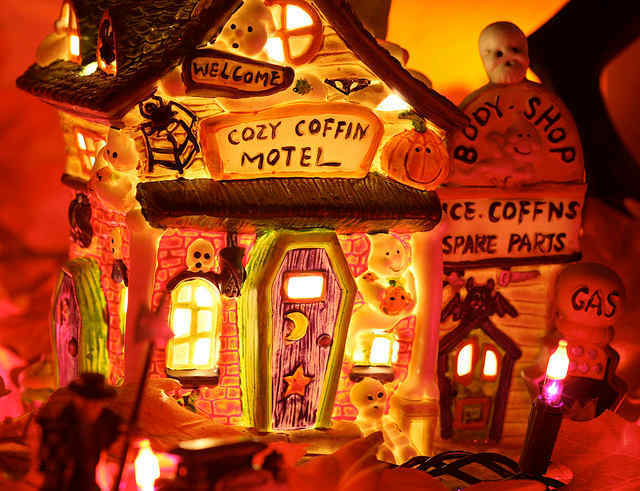 There are plenty of games and activities that don’t involve candy — decorate little pumpkins, hold a costume contest, visit haunted houses or show a spooky movie with some fresh-popped popcorn. Offer alternatives to candy. Serve healthy treats such as popcorn, granola bars, trail mix, raisins or pretzels. Or hand out non-food items like pencils, rings, bracelets, stickers, crayons, plastic snakes, bouncy balls — the items that we typically give kids in birthday goodie bags. Just be aware of choking hazards with young kids. Limit the houses that children visit. Give them a two to three block radius, so they are able to gather a moderate amount of treats only from known neighbors and friends.